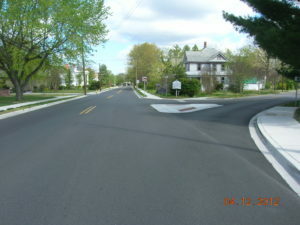 This project involved the complete reconstruction of 5th Ave. and several side streets in downtown Denton, MD. The project involved the installation of new 8” water mains and services, the installation of a closed stormwater drainage system, replacement and new curb & gutter, sidewalks, driveway entrances and handicap ramps, the complete restoration of existing pavement with the installation of both base and surface asphalt pavement courses and the installation of striping, crosswalks and thermoplastic surface markings. Lane Engineering, LLC was responsible for planning, engineering design, specifications, funding assistance and management for local, SHA-ARRA and USDA-RUS funds, permitting, bidding, award, construction management, daily on-site construction inspection and project closeout including as-builts. Fixed fee quotes for design services and scope related adjustments thereto were not exceeded. Absent a design scope change based on a request from the owner, Lane Engineering, LLC maintains its fixed fee quotes when billing for services. When our quoted estimate of time required to perform is inadequate, we do not submit to the owner for additional compensation. 1,526 feet of storm drain piping and related inlets/structures.